Coconuts and coconut oil is often perceived as bad for your health except for use on the hair. 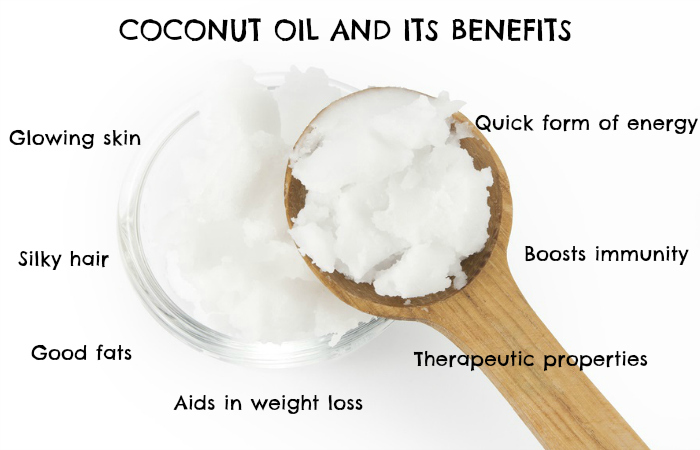 But do you know the many benefits of coconut oil for a healthier you? The minute you hear the word coconut, first thing that comes to mind is ‘calories, calories and more calories!’ To my mind it is- “Yummy calories! !” Yes, I am one of those who just loves the coconut flavour and could really eat things made out of it all day long. Though the big issue here is, that I am still trying to get that pregnancy weight off, so coconut is off limits. But then, I was doing some research (the curious soul that I am), about healthy eating a couple of months back and one thing that came cropping up was coconut oil! Yup, you read that right! Believe me when I say this, coconut oil is very healthy and no, not just for those lustrous locks that you’ve always wanted, but also for cooking food. All my South Indian friends would be laughing at me right now and pointing “see, you should’ve listened to us”. But coming from northern part of India, I’ve never seen anybody using coconut oil for consumption. It’s just been a staple in the house for long and silky hair, and its use is limited to that. Coconut oil is the richest source of saturated fats known to mankind, but the healthy fact is this saturated fat is in the form of MCTs (Medium Chain Triglycerides) which are fatty acids of medium length and are metabolised in a very different way than the long chain ones (which are most of the other fatty acids in our diet). These MCTs go directly to our liver for digestion, so they are a quick source of energy. The MCTs in coconut oil also have a therapeutic effect on many brain disorders including Alzheimer’s. About 50% of the fatty acids in coconut oil is Lauric Acid (which is also found in abundance in human breast milk) that can kill bacteria, fungi and viruses. Thus, a boon to boost that immune system. Because of it’s high saturated fat content, coconut oil helps in reducing hunger. So a very good thing to include in your diet when you are watching that weight. It is also an immediate source of energy when eaten (as I mentioned above) that isn’t stored as fat. So, now the question comes, how to use more of coconut oil at home? For cooking- Coconut oil has a very high smoking point, so is very useful for frying, stir-fries, popping pop corn, cooking eggs and the like. It’s also a dairy free replacement for butter (for people who are vegan or allergic to dairy), so try making that granola even healthier by using coconut oil instead of butter and also for more coco-nutty flavour. It can also be used in salad dressings, as it has a very smooth and creamy texture. A lot of people add it to their coffee and their smoothies- still have to try that out! It makes one of the best eye make up remover. Also an awesome diaper rash cream. Can be used to get rid of cradle cap on babies- just massage on to head, leave on for a few minutes and gently rinse with a warm wash cloth. Makes a brilliant body scrub- mix with equal parts sugar and use in the shower. Can be used for moisturising, but if you are put off by its smell, try mixing it with Shea butter. What kind of coconut oil to use? There are so many varieties available in the market that you’ll be surprised (at least I was). For external purposes any refined form can be used. But for internal usage it’s best to use unrefined virgin coconut oil, and here’s a link to the one I have started using and quite liking it. How do you use Coconut oil? Would love to find more ways. Image source: coconut and oil by Shutterstock.